The First Cruise Ship to Dock Here! In the Truman Annex is the privately owned Pier B and the Navy’s pier is called the Navy Mole. It was here in 1969 that the first cruise ship docked and allowed its passengers to venture out into Key West to explore as cruise ship tourists! The name of the cruise ship to first dock in Key West was the Sunward of the Norwegian Cruise Ship Lines. 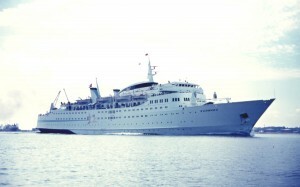 She sure was the start of a wonderful cruise ship tourism industry! The Norwegian Cruise Ship Line’s the Sunward! Isn’t she a lovely 60s style ship? Posted in Key West | Comments Off on The First Cruise Ship to Dock Here! What we love and now know as the Truman Annex was once the Fort Taylor Annex. The area where the Truman Annex lies used to be a submarine pen that was used for the Fleet Sonar School. 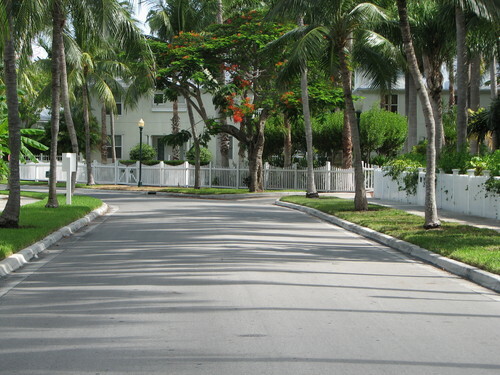 The Harry Truman Little White House used to be the commandant of Fort Taylor’s house. However, the Fort Taylor Annex has since been demilitarized and given to private developers and the city of Key West, and renamed the Truman Annex. There are still a few governmental offices such as the NOAA Hurricane Forecasting Center and the Navy still owns the piers in the Truman Annex area. The beautiful and idyllic Truman Annex. Harry Truman wasn’t the only president to visit our island. While he did visit for a grand total of 175 days during his eleven visits as the president and several more times after he left office, other presidents have also visited the famous Conch Republic. 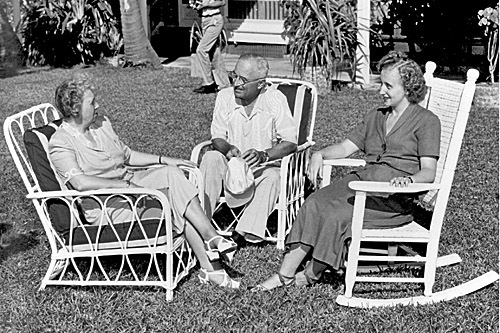 Franklin D. Roosevelt visited in 1939 and Dwight D. Eisenhower even came here for some R&R after having a heart attack. In 1962, John F. Kennedy stayed here for a whole month following the resolution of the Cuban Missile Crisis and Jimmy Carter held a family reunion here right after he left office. An iconic picture of Harry Truman sitting on the lawn of the Little White House. You are currently browsing the Old Town Trolley Tours Blog blog archives for March, 2014.